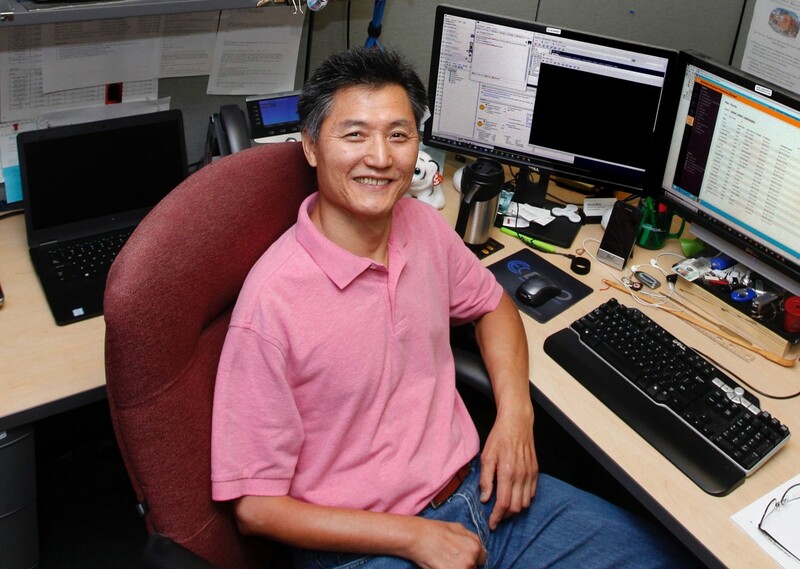 Monitoring more than 300 servers and 1,300 workstations, Bang strives to make working at Jefferson Lab accessible and efficient. At 6:30 a.m., Myung Bang turns his computer on. He must ensure that all of the 300 servers and 1,300 workstations he manages as the system administrator are behaving correctly before everyone else starts to arrive. Dong Myung Bang grew up the middle child of three boys: all named Dong Bang. “In Korea, one generation of kids will all have the same first name then the next generation will have the same middle name,” Bang explained. Since the Bang brothers all had the same first name, there were many confusions when they first arrived in America, including Bang attending a job interview intended for his brother. He ended up getting an offer. The Bang brothers grew up in a remote farming village of Boeun, South Korea, where they received only a few hours of electricity each night around dinner time. “Afterwards, I still remember we all gathered into one room under candlelight to read books,” Bang recalled. His mother was strict. She required of her boys focus and determination. “She always made sure that we did our homework and studied for our tests,” Bang said. When the boys reached middle school age, Bang’s mother dreamed of a better education than their small town could offer. “She believed if you want to be a big fish, you need to go into bigger water,” Bang said. So, in 1979, Bang’s family packed for America. They were headed to Pennsylvania, where an uncle awaited their arrival. After six months, the Bang family moved to Richmond, Va., where his mother’s brother helped his parents open a local “mom-and-pop” store. Sixteen-year-old Bang and his brothers headed to high school. Bang grew up a shy child, and he spent his childhood reading everything he could find. “I thought I was going to be a writer,” he said. It was in high school, while he sat in class trying to learn English, that math revealed itself as the universal language. Bang attended Virginia Polytechnic Institute to study electrical engineering and minored in mathematics. He continued his studies, gaining a master’s degree in information assurance at the University of Maryland University College, eventually landing himself a job as a programmer with Computer Sciences Corporation. On his first day of work, Bang found himself as a programming contractor with NASA Langley Research Center. That same day, however, their systems administrator quit. From that day on, Bang worked hard to understand computer systems. In 1998, as his contract was ending at NASA Langley Research Center, he applied for and accepted his job at Jefferson Lab, where he monitors and cares for the advanced software systems that drive its computers. Working with Jefferson’s Lab’s Cybersecurity Team, Network team, Windows, Linux and Mac Teams, as well as the Help Desk, Bang keeps Jefferson Lab’s technology and systems up to date and functioning to prevent work stoppage. Issues pop up in all forms: files become vulnerable; a virus breaks free; a certificate on someone’s smart card expires, locking them out of the system; a corrupted file locks down; a problem domain controller refuses users’ login; the email server doesn’t deliver emails, etc. Bang is responsible for monitoring and resolving all alerts from systems, providing day-to-day maintenance of the operating systems, managing various commercial products, installing and configuring systems, and determining if patches are needed. He is also responsible for researching and testing out the latest technology that could make computer systems more efficient and capable. Troubleshooting, Bang has discovered, is one of his passions. When Bang isn’t working, he is clocking in hours on the tennis court to add to his 30 years of tennis experience. “Tennis fits me,” Bang said, smiling. But he always has his eye on the systems.